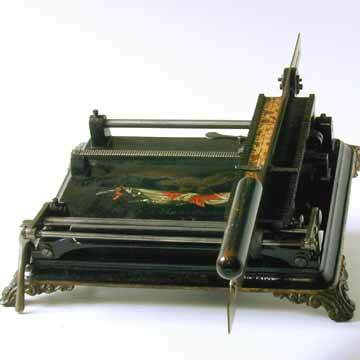 This is not a paper cutter or a saw, but the first typewriter ever produced in Germany. This 1882 linear index machine was invented by A. Hansen-Hamburg. The capital type is placed on the 'saw blade' with the large wooden handle on the end. The blade is lifted and shifted to select the proper character. Printing was done by pushing the blade down. The blade automatically moved one space. To the left of the blade you can see the space key. The Hammonia used a 20 meter ribbon of carbon paper or inked silk and writing was immediately visible. A folding leg (pics 3 and 4) positions the machine at an angle for easier operation.